The knee is the largest joint in the body. It is a complicated joint that bears the entire weight and pressure loads of the body, all while providing flexible body movement. When we walk, the knees support 1.5 times the body weight at any given point, climbing stairs – the knee support 34 times the body weight. When you are squatting the knee is carrying nearly eight times. The knee joint is called the synovial joint; that connects the femur bone, also known as the thigh bone, which is the longest bone in the body, to the tibia or shinbone, which the second longest bone in the body. There are two joints in the knee. First the Tibiofemoral joint and second the patellofemoral joint. The tibiofemoral joint attaches the tibia to the femur. The patellofemoral joint attaches the kneecap to the kneecap. These two joints work together to create a modified hinge joint that provides the knee ability to bend and straighten, as well as rotate side slightly to side. The knee is linked to a chain of structures; that includes the hip, pelvis, upper leg above the knee, and the lower leg, ankle, and foot, below the knee. These structures all work together to provide movement and functionality. The knee joint bears most of the bodies weight. When you are sitting, the tibia and femur hardly touch: When you stand they lock together to form a stably connected structure. The main parts of the knee joint consist of the bone, ligaments, tendons, cartilages, as well as a joint capsule – made of collagen. Collagen is fibrous tissue that exists throughout the body. With age, collagen breaks down. The adult skeleton is primarily made up of bone and a small amount of cartilage in certain areas. The bone and cartilage connect with each other and other tissues. These have special cells called chondrocytes that are planted inside a gel-like material called collagen and elastin fibers. Cartilage consists of hyaline or fibrocartilage which can differ based on the amount fo elastin and collagen inside. Cartilage is tough but flexible tissue that is good with body mass weighing on it. Cartilage has almost no blood vessels and is not able to repair itself very well. The bone is full of blood vessels, which allows itself to repair itself much better. The bone also has high water content that ena bles the cartilage to be flexible. Tiba- is often referred to the shin bone, runs from the ankle up to the knee. The very top of the tibia mad of two plateaus and protuberance similarity to knuckles called the tibial tubercle. Connected to the top of the tibia on each side of the tibia plateaued are two cartilages that are current shaped. These cartilages are called the meniscus, and absorbs shock, to he;p support the knee. 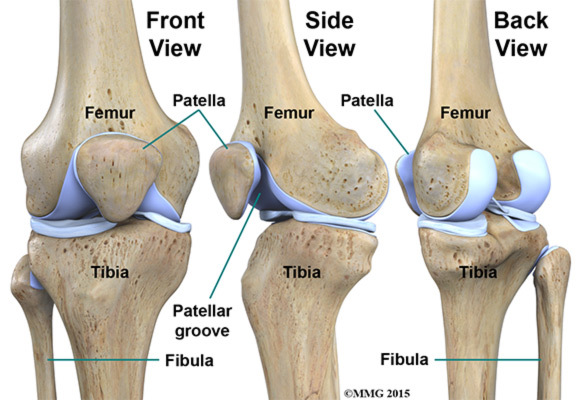 Patella – this is the kneecap that is flat and triangular bone. The Patella moves when the leg moves. The Patella relieves friction between the muscles and bones when the knee is straightened, bent, or to protect the knee joint. The kneecap descends along the base front surface of the femur between two protuberance called femoral condyles. Femoral condyles create a grove referred to as the patellofemoral groove. Fibular – long thin bone in the lower leg on the lateral side, and runs against the side of the tibia from the knee of the ankle. The knee functions similar to a rounded surface sitting on top of a flat surface. The ligaments attach bones to other bones and give strength and stability to the knee as well the knee has very little stability. Ligaments are strong, strong bands that are not particularly flexible. Once stretched they tend to stay stretched, and if stretched too far, they snap. Medical Collateral Ligaments (tibial collateral ligament) – attaches the medial side of the femur to the medial side of the tibia and limits twisting motion of your knee. Lateral Collateral Ligament (fibular collateral ligament)- connects the later side of the femur to the lateral sided of the fibular and restricts sideways movement of your knee. 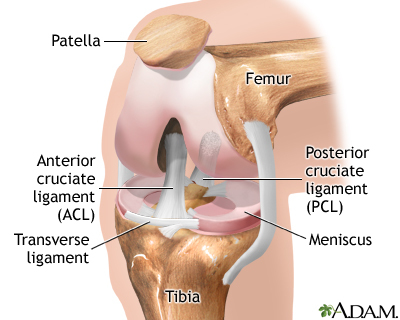 Anterior cruciate ligament – connects the tibia and the femur the center of the knee. 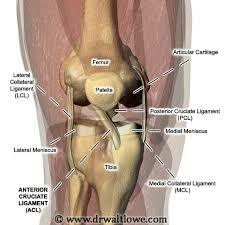 It is located deep within the knee and is front of the posterior cruciate ligament. Posterior cruciate ligament – this is the strongest ligament that connects to the tibia and the femur. I t is deep within the knee behind the anterior cruciate ligament. It restricts the backward motion of the knee. 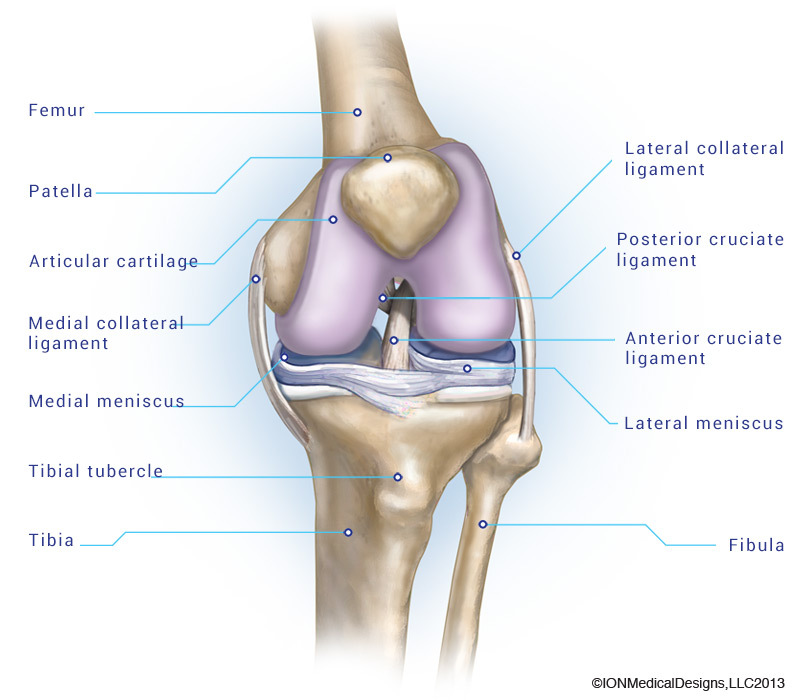 Patellar ligament – connects the kneecap to the tibia. The pair of collateral ligaments prevents the knee from moving too far form on the side to another. The cruciate ligaments cross each other in the center of the knee. The cruciate alignment allows the tibia to swing front to back underneath the femur without the tibia sliding to far forwards or backward. The lateral collateral, anterior curia, posterior cruciate and patella ligaments are the most surgical structure for creating stability within the knee. The patellar ligaments connect kneecap to the tibia and helps in stability. The iliotibial band is similar to a fascia belt, which runs along the side of the leg from the hip downward to the knee and limits the lateral movement of the knee. Tendons are elastic tissues that part of the muscles and connect the muscle to the bones. 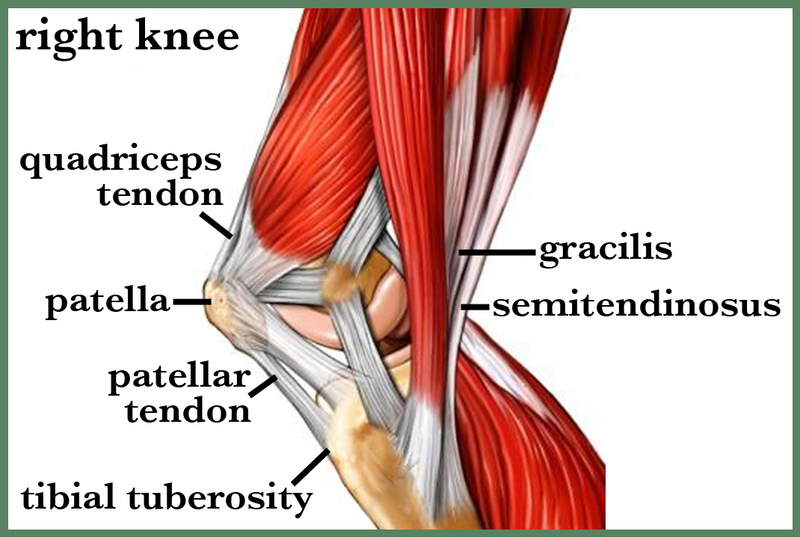 The two major tendons in the knee are patellar and quadriceps. The Patellar tendon connects the kneecap to the tibia or shinbone; which is a ligament. The quadriceps tendon attaches the quadricep thigh muscles to the kneecap and provides the ability to straighten the knee. If two bones touch each other, there is a joint at the end of the bones. The joint is covered with articular cartilage – called this because when the two bones move against each other. Articular cartilage is a fibrous connective tissue that is white and smooth, which covers both ends of the bone and protects the bone during joint movement. The particular cartages of the knee also cover the feeder bones and the top of the tibia as well as the back of the patella. There are menisci disc-shaped cushions in the middle of the knee to absorb shock. The lateral meniscus is a crescent-shaped cartilage, made from fibrous tissues connected to the tibia outside the need. Articular cartilage is at the end of the bone in, within the joint which covers the bone. The articular cartilage is in the synovial fluid, made by the synovial membrane (joint fluid) The cartilage becomes smooth and slippering with this fluid and allows the bones to move against each other easily without pain. The synovial fluid is very slippery and sticky; The articular cartilage is very slippery, nearly three times more slippery than skating on ice and 4-10 times a slippery as a metal or plastic knee replacement. 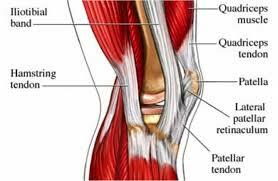 The muscles in the leg help keep the knee stable, moving and an aligned the thigh muscles (quadriceps and hamstrings. There are two muscle groups in the leg, the quadriceps, and hamstrings. The quadriceps are a collection fo four muscles on the front of the thigh and are responsible for the movement of a bended knee to a straight position. The hamstrings are three muscles groups responsible for the thigh muscles and control knee moving from straight to a bent position. The capsule is a compact, fibrous structure that warps around the knee joint. Within the capsule is the synovial membrane which is lined bt the synovium, the soft tissue that secretes synovial fluid when it is inflamed, providing lubrication for the knee. Bursae comes in different sizes around the knee. There are can be up to 13 sacs that are filled with fluid to cushion the joint and reduced friction between, the nones, tendons, ligaments, and muscles. The bursa is underneath the tendons and ligaments, on the medial and lateral side of the knee. 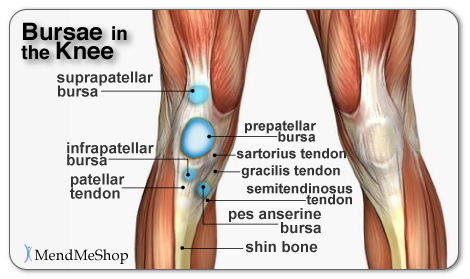 The prepatellar bursa is the largest bursa located in front of the knee under the skin, protecting the kneecap. There is as also an infrapatellar fat pad that cushions the kneecap. Plicae are folded in the synovium. Plicae rarely cause issues but can get caught between the kneecap and the femur and causes pain.